You’d probably agree that baby diapers are one of the baby essentials you can never go without when leaving for a quick errand or long drive or even when you’re just at home. You make sure you’re all backed up with a few or more because you’ll have to change these diapers now and then to keep your baby dry all day and night! As a mom, you know you need more than just a pack or two. Well, these will be your baby’s potty pal every day for the next three years! But, which should you choose? What are the high-quality brands in the market? Don’t worry! Our top 10 list of the best baby diapers in 2019 will help you out on that. Keep reading! The following factors are what you should consider first before buying the diapers for your baby. Don’t settle for any kind of diaper and decide carefully! MATERIAL: It is very important to know what material the diaper is made of. Most of the available diapers on the market these days are eco-friendly and made of the high-quality chlorine-free materials. You should avoid those that contain lotion, fragrances, dyes or latex. These materials and substances can cause irritation to your baby’s skin, diaper rash, and allergic reaction. COMFORT and FIT: All these diapers are designed with stretch sides and fasteners to keep your baby comfortable at all times. Don’t settle for a diaper that seems too tight or too loose for your baby. But rather choose the one that provides the comfortable and secure fit. So that whenever he takes those little crawls or footsteps, he’d still be fully protected. SIZE: Diapers come in different size and these manufacturers make sure you have the perfect size for your newborn baby or toddler or whatever age or weight your baby is. You can check their size chart to know which size is the perfect for your little one or else, your baby will end up with messy leaks, inadequate protection, and discomfort. ABSORBENCY: This is one of the major factors you should consider. You’re buying a diaper because you want to keep your baby dry all day and night without waking you up in the middle of the night and to keep your baby comfortable all the time. Each of these diapers is designed and equipped with absorption technology that pulls the wetness and mess away from your baby’s skin. PRICE: As a mom, budgeting is one of your toughest responsibilities as you have to make sure every penny is well spent. These diapers also come with different price tags. Some could be really hefty while some are incredibly affordable. But not all quality diapers should be really expensive. Always make sure that when you’re buying diapers for your baby, you’re settling for the excellent quality. These diapers are 3X drier than normal diapers. Therefore your baby can sleep quietly without uninterrupted. The reason for this is these diapers contain three layers of absorbency, hence your infant can get about twelve hours of protection. The different sizes available are number one and two contain a color changing wetness sign to assist you to understand when it may time for a change. These diapers are found in sizes N one to six. These diapers do the best work at holding on to the mess. Most of the customers have also given three stars for this diaper. 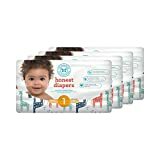 These diapers are best suitable to be used in planes and for long travels. Busy mom also gets a good night sound sleep every day. These baby diapers have a vote of the most absorbent diaper. It has a feature of special revolutionary 3D core absorbency method that helps an absorption capacity of two to three liters. This special system creates best suitable for a busy lifestyle and routine undisturbed night rests. The leak control system will make the clothing, skin, and bedding dry for more than ten hours. 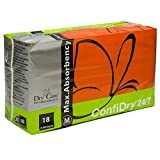 The maximum absorbency brief lets for two three changes within one day. It is strong and durable, contain a comfortable soft lining which permits you to travel, walk and exercise confidently. The top layer let quick urine penetration to the 3D core absorbency methods and removes moisture from the body to make the skin dry and free from irritation. Your utmost priority is to give your baby a goodnight sleep at and a comfortable playtime any time of the day. That’s why Luvs Ultra Leakguards diapers ensure to keep your baby dry all day and all night with its leakguard core. It absorbs the wetness while keeping it gentle to your baby’s delicate skin. The Nightlock Plus also locks away the wetness that troubles your baby at night. No more sleepless nights for you and your little one! The large and re-fastenable stretch sides provide perfect and secure fit and comfort. 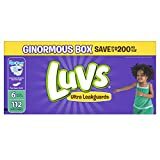 You can get them at an affordable price but if you’re not satisfied with these nappies, Luvs gives you a money-back guarantee! You sometimes won’t know when to change his diapers until he cries and wakes you up early in the morning or in the middle of the night. That’s tough! Isn’t it? You might need to change those baby diapers again and again or better yet, change them forever! 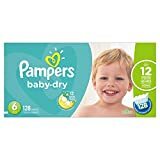 So if you’re looking for disposable diapers that would snuggle your baby’s delicate skin all day and night, Pampers Baby Dry Diapers features a wetness indicator that lets you know when you should change those nappies. It also has 3 layers of absorbency that provide up to 12 hours of overnight dryness! If you’re looking for great quality nappies for your newborn baby, the Bambo Nature Premium diapers are guaranteed soft on your baby’s skin. Bambo Nature baby diapers are free from harmful chemicals and allergens that might cause irritation to the skin. Thus, these diapers protect your newborn from getting diaper rash or allergy keeping his skin healthy and smooth. Bambo is also an environmental health advocate and hence, designed these diapers to be eco-friendly! They are also ultra-absorbent that gives your baby a sound sleep overnight and during the daytime. 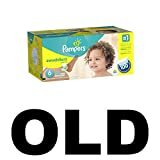 Pampers is no doubt one of the widely-used diapers across the globe. Pampers promises to keep your baby snuggled with a superior comfort and ultimate protection. It also has the Pampers signature feature wetness indicator which tells you when your baby needs a diaper change. Keeps your baby dry all day and night! The Unique absorb away liner also adds comfort to your baby as it pulls the wetness and messes away. The extra absorb channels, on the other hand, evenly distribute wetness that provides 12-hour protection. It also comes in different sizes so you’ll definitely find the perfect fit! For those who have babies with a weight of 27lbs, the size 5 Pampers Swaddlers gives your baby the ultimate protection he needs whenever nature calls! The extra absorb channels and the gelling material makes these nappies more absorbent that prevent leaks and mess. As what Pampers always promises, these diapers ensure to keep your baby extremely dry and free from wetness. The wetness indicator lets you know when to change your baby’s diapers before he would start to cry! You may spend a few more bucks for these diapers but they’re definitely worth the price. Huggies is also one of the most trusted diaper brands in the market. And with these OverNites diapers, Huggies is 25% more absorbent than the Huggies Snug and Dry diapers. 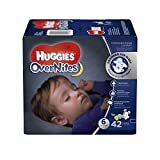 If you really want to prevent those sleepless nights and give your baby a goodnight sleep, give him the protection he needs with the Huggies OverNites Diapers. It is designed with double leak guard that keeps the moisture in the diaper and a leak lock system that provides 12-hour protection from those messy leaks! It guarantees a sound and restful sleep or your money back! Another brand that stands out in the market is the Honest disposable diapers. Aside from those multi-colored Giraffe prints, it is designed with advanced leak protection and moisture barrier cuffs that prevent any leakage and blowouts. These diapers are designed to minimize risks of skin irritation, diaper rash, and allergy with its hypoallergenic materials that are also free from harmful chemicals. Honest diapers also promise to keep your baby any time of the day with its super absorbent core. They are easy to put on and the stretch sides provide a secure and comfortable fit. The best thing about these diapers is they are made without latex or fragrance in the diaper. 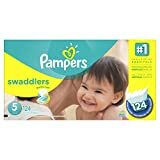 So if you can spend a bit over the budget and wants to maintain a healthy environment to dwell in, take these eco-friendly diapers on your list. When your baby takes its first crawl, you’ll definitely need a diaper that would be fit and snug all day! 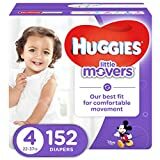 The Huggies Little Movers handles it all for you. They are specially designed with contoured shape and snugFit that protects your active baby from his tiny adventures to his very first step! It is also designed with double grip strips that provide a flexible and comfortable fit while protecting your baby from those messy leaks. And if you want to keep your precious one comfortably dry, the DryTouch Liner and Leak Lock System lock away the wetness up to 12 hours. Your baby has the most delicate skin and finding the best baby diapers for your precious one needs careful research. To get those comfortable nappies with a superior protection, you have to consider first the material, the comfort and fit, the absorbency, and size. We hope that our list of the best-selling diapers, including the reviews and buy guideline, has helped you find the best diaper for your baby.